Home News Numero eSIM App Is Now Available In Huawei AppGallery! If you own a Huawei device, you can now download Numero eSIM app from AppGallery, buy virtual numbers and enjoy making cheap international calls. Huawei AppGallery makes it easy to download the app if you facing a problem with Google Play Store in your Area. AppGallery is a preloaded app store on the latest Huawei and Honor smartphones, this app store is an alternative to Google Play store, where the owners of Huawei devices or Honor devices can download apps and search for new apps to install on their mobile phones. Android users in many areas all over the world do not have an access to all apps in Google Play store due to regions restrictions. Now this problem is over for Huawei and Honor smartphones owners. 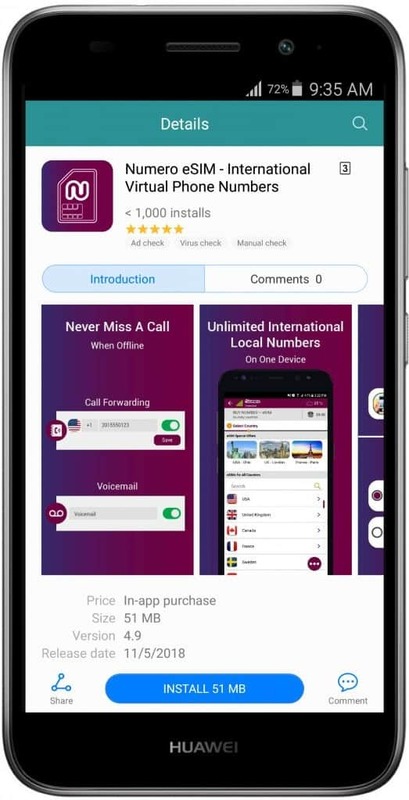 For all Huawei smartphones owners, if you having an issue when you trying to download Numero eSIM app from Google Play store on your android mobile phone, you can download it successfully from Huawei app store “AppGallery” and register to enjoy your free virtual phone number for the first 24 hours, then buy your number to continue using Numero’s amazing features. What about you? are you one of Huawei smartphones owners? did you like the new updates in Numero? tell us in the comments bellow. Wait for more surprises and new features from Numero eSIM app soon.